Happy Easter! Felices Pascuas! Joyeuses Paques! Buona Pasqua! Frohe Ostern! We call Easter the Paschal mystery: paschal relates to the “paschal lamb” of Passover, which Jewish communities celebrate during our Easter celebration this year. Easter is about the daybreak, starting over. Jesus’s resurrection is a new day. This is a time to be joyful, happy, enthusiastic about life. We have so much to be grateful for, especially the gift of faith in Jesus Christ who is our way, our truth and our life. Every morning, we awaken to begin again. Perhaps the night before, we carried burdens: things undone, bad things said, good things unsaid. In the morning all is possibility, opportunity. Who among us is content with things as they are? Who does not want to be more loving, more generous, more tenderhearted, more thoughtful, more helpful? This Easter, God wakes us up again, to rediscover the extraordinary graces transforming our lives TODAY. In the Gospel according to John, chapter 20, we hear the story of the resurrection of Jesus. 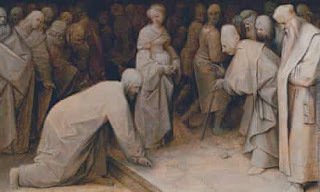 Mary Magdalene finds the tomb empty. Shortly thereafter, Christ appeared to Mary Magdalene outside the tomb, to the disciples in the upper room, and on the road to Emmaus. Jesus is not among the dead. Jesus is risen. He is alive. He has passed through this earthly life – as we do --- and then through the mystery of death into a new, transfigured reality. This heavenly reality is ours as well. That is the Easter message! Jesus said, I live, and because I live, we also live. How? We are born in the flesh and reborn in the Spirit. Water is poured upon us in the rite of baptism, and in these waters the Spirit of God is poured upon us, and the triune God lives within us, and we live within the triune God. As we grow into adolescence, the bishop anoints our forehead with oil in the sign of the cross—and God pours out more fully the gifts of the Spirit so that we might practice more faithfully all of the fruits of the Spirit: patience, generosity, faithfulness and love. And at the Eucharist, where the living Christ sacramentally presences himself to us in the signs of bread and wine, and becomes one with us in Communion,; the living Christ feeds us with his life so we can continue our journey. 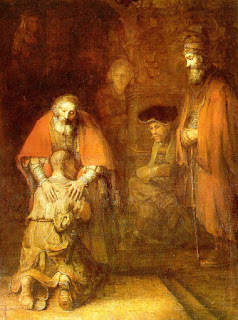 If we should stumble on our journey, the living Christ lifts us up in the rite of penance where we celebrate God’s mercy. Yes, through the sacraments, we experience the living Christ and we go forth to love and serve one another. The exchange of wedding promises, the anointing of the sick, all the sacraments are indeed signs of God’s care. Easter is indeed about a new day, a fresh start. Why. Because Jesus Christ lives. And because He lives, we live. On Palm Sunday, some two billion Christians worldwide begin Holy Week, the chief week of the Liturgical Year. We focus in particular upon the Paschal mystery: the journey of Jesus from this earthly life through the mystery of death into heavenly life. “Paschal” refers to the Passover: the passing of the angel of death over the homes of the Hebrews in ancient Egypt. In a larger sense, Passover refers to the exodus or liberation of the Hebrews; every year the Jewish community re-experiences this in the Seder – a word meaning order -- which they will celebrate April 20. Today on Palm Sunday, we reflect upon a paradox of triumph and tragedy: the triumphal entry of Jesus into Jerusalem, and on the other hand the Gospel proclamation of the passion and death of Jesus. And even in the tragedy of Good Friday there will be the triumph of Easter: Jesus, crucified, risen and in our midst. The Word of God from Isaiah is a poem about a “servant” who suffers for us (the early Christian community saw Jesus in this servant). Paul’s letter to the Christian community at Philippi quotes an early Christian hymn about God who became one of us. And the Gospel according to Luke proclaims the passion and death of Jesus. This coming Thursday, Friday and Saturday are known as the triduum (from a Latin word which means a period of three days). On Thursday Christians will commemorate the Lord’s Supper: there is the washing of feet (a symbol of service); and then a sacrificial meal in which Jesus gives himself to us in the signs of bread and wine (a symbol of our oneness with God and with our fellow human beings). On Good Friday we meditate upon the passion and death of Jesus, and have a simple communion service. 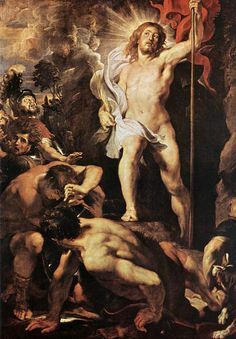 And at the Easter vigil we reflect upon the passage of Jesus from this earthly life through death into a transformative heavenly life; the resurrection of Jesus is a pledge of our own liberation from death or nothingness into eternal life. The Vigil includes fire (a symbol of Jesus as the light who illuminates the darkness around us), the proclamation of the story of our salvation in the Scriptures, the renewal of our baptismal promises, and the Eucharist. Easter proclaims that Jesus is risen; alive among us. I urge all of you to participate in these services as much as you can. Throughout the 40 days of Lent we have been trying to steer our lives toward the light of Jesus Christ, trying to shake off darkness around us, and the burdens of our daily lives. I pray that this Holy Week will inspire us to seek ever more enthusiastically the God who became flesh in Jesus of Nazareth, and who by his death and resurrection opened up to all humankind a transformative eternal life beyond this earthly life. How many followed this year’s NCAA championship basketball games? Sometimes you win, sometimes you lose. As the saying goes, what’s important is how you play the game, and how you live with what you learn. Today’s word of God takes us back to Ancient Israel in the 6th century before Jesus. Babylonia had conquered the Hebrews; destroyed Jerusalem and the Temple; and deported many Hebrews. Yet God fired up the Hebrews with hope for the future. Set free by Persia, they returned to their homeland to rebuild. The author proclaims God will breathe hope into the Hebrews. Yes, God will usher in a new age, and a newly created people will praise God. The author may well ask you and me: When have we breathed hope into the life of someone who is “down and out” with encouragement or a helping hand? Paul writes his letter to the Christian community in Philippi, Greece from an unknown jail cell, perhaps in Rome. And what motivates Paul? Paul proclaims that Jesus Christ “possesses” him. Yes, years before, Christ had turned Paul’s life “upside down” on the way to Damascus. And ever since, proclaiming the good news--Jesus Christ is alive. And because He lives, we live-- was Paul’s one passion in life. And so Paul sets his eyes on “what lies ahead”: eternal life. In the Gospel of John today, we hear that Jesus meets a woman who had been caught in an adulterous relationship. I wonder if Nathaniel Hawthorne read this Gospel story before he wrote The Scarlet Letter. Anyway, Jesus says to us in the Gospel story, “Don’t be so negatively judgmental about other people.” All of us need forgiveness. That’s why Jesus came: to forgive, heal, transform us, to save us from death and propel us into a glorious future, like Jesus did to this down-and-out woman and to her accusers. And what about the man in the adulterous relationship, who was as guilty as the woman? This story invites you and me to reflect on our own willingness to forgive people who have wronged us, intentionally or unintentionally. Jesus says forgiveness is a primary characteristic of discipleship. We have to forgive ourselves as well as others so we can move forward with our lives. To forgive as Christ forgives sometimes seems impossible to do on our own. It calls for a humility, a generosity, a spirit of compassion. But Christ doesn’t ask us to forgive on our own. He simply asks that we participate in his gift of forgiveness. Forgiveness is an act of the will that overrides negative feelings about someone. Forgiveness is possible, not when we try to forgive, not on our own, but when we trust in God to bring healing. As God constantly searches out the lost and the stranger, so should we. Forgiveness can be a long journey, but at the end lies freedom and new life. This Sunday is known as Laetare Sunday. Laetare is a Latin word meaning “rejoice.” Why rejoice? Because we are close to our salvation, the Easter mystery. In modern times, Easter is often boiled down to eggs and the Easter bunny. Many people ask, what’s the connection? Originally, eggs laid during Holy Week were saved and decorated and then given to children as Easter gifts. Chocolate eggs appeared in the 19th century. And the Easter bunny? Rabbits usually give birth to a big litter, so they became a symbol of new life. Legend had it that the Easter bunny lays and hides eggs. Thus, the Easter egg hunt. So much for folklore. What does the word of God say to us today? In the Gospel, the parable of the prodigal son has many levels of meaning, inviting us to see ourselves in the characters. The younger son asked his father for his inheritance, squandered it—and then he “comes to his senses.” An amazing phrase! He realizes his true identity as a beloved son. His father unconditionally forgives and loves him and gives him a party. This parable may move us to ponder forgiving someone. If we can’t forgive on our own, pray for the grace to participate in the forgiveness of Jesus, who pardons those who come to him and try to start their lives afresh. And who is this Jesus who loves and forgives us unconditionally? Did you ever wonder what Jesus really looked like? Great painters give us different portraits. 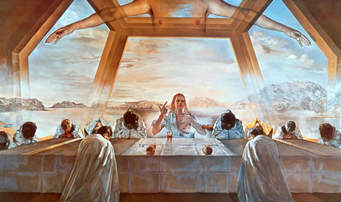 The Gospel writers Mark, Matthew, Luke, and John also give us different portraits, and various ways to bring forth Jesus. They faced a unique challenge. How portray someone completely human and yet completely divine? Moreover, they wrote to different audiences. Which Gospel is most authentic and best reflects the historical Jesus? They all do. Mark was the earliest, shortly after scores of Christians perished during the persecution of Emperor Nero. Mark thought he ought to write who Jesus was, what he taught, and what he did. The Jesus in Mark is very human: the Messiah who suffers so that we can live forever. What happened to Jesus, Mark says, can happen to us too. Luke’s and Matthew’s portraits are similar. In the Gospel of John, Jesus is noble, majestic, and divine. Remember how this Gospel opens: in the beginning was the Word. Yes, Jesus is completely human and completely divine. Jesus in John is the revealer of the mystery of God, the face of God among us. Jesus, the God-man, is more than any one person can adequately describe. And so, each of us might ask: how do I reflect Jesus in my daily attitudes and behaviors? Rediscover a portrait of Jesus by prayerfully reading and listening to the Gospel. Let the portrait fire you up to become an ever-more-faithful disciple.